The holidays are upon us, and as cooler temperatures arrive, we start dreaming about sunny beaches and icy drinks with tiny umbrellas. More specific, the resort vacation! Am I right? Planning the perfect vacation is essential; although, having a fabulous wardrobe while on vacation is just as important. Once your vacation is planned, it’s time to execute the refresh of your resort wear and make sure it is on point for your upcoming resort getaway! As I started to plan my wardrobe for an up and coming (hopefully) soon to be beach vacation, I came across a Caribbean inspired clothing company called HIHO. As I browsed their website, I was impressed with their collection. Their collection includes dresses, shorts, pants, tops, sweaters and additional casual wear at affordable prices. Not only for women but men as well. They have you covered for all resort wear essentials! I have rounded up a few of my favorites from their site to share with all of you. Off the shoulder, Sugar Cane Maxi Dress is perfect for elevating your boat game or perfect date night on the beach. The dress has an elasticized waist and is made of 100% crinkle cotton. This beauty runs true to size and is priced at a very reasonable $148. For those who want to look fashionable while protecting their skin from the sun, the Boatneck Suntech Dress is calling your name. The dress is very flattering! The side slits add a little something extra to the mid length dress. The dress is currently available in Night Sky Stripe and Cherry Tomato Strip for $89! My FAVORITE dress has to be their Cape Shirtdress- Tradewinds Multi Stripe for $89. It’s a very versatile dress you can wear all day long! It has the exaggerated turtleneck with a drawstring pull, which is perfect for those chilly nights. A total win! You cannot go wrong with any of their dresses. Click here to shop all their new dresses. Choosing a few of my favorite sweaters from HIHO was a difficult task because I loved them all! I can see myself wearing all of them during my trip or even at home. One that caught my attention was the Relaxed Crew Sweater – Night Sky. I am obsessed with the color and how comfortable it is. You can wear it on its own or even over one of their button downs. It is a chunky knit sweater, drop shoulder and runs longer in the back. You can easily dress this up or down. This style sweater is available in a variety of colors; Night Sky, Night Sky Stripe, Mainsail White, White, and Aruba Blue. If you don’t want to rock the chunky knit, they have a lighter weight version available as well. You are guaranteed to receive compliments on this sweater every time you wear it. Want to see what other sweaters they offer? Click here! If you are looking to take your button down to the next level – check out their Twig Tops. My favorite colors would be their Chambray and Bright White. They have a couple of colors online now, and my favorite colors will be available soon – you won’t want to miss it! These sleeves are a perfect length, and the overall fit is incredibly flattering. You can wear the Twig Top on its own or under a sweater with a popped collar! 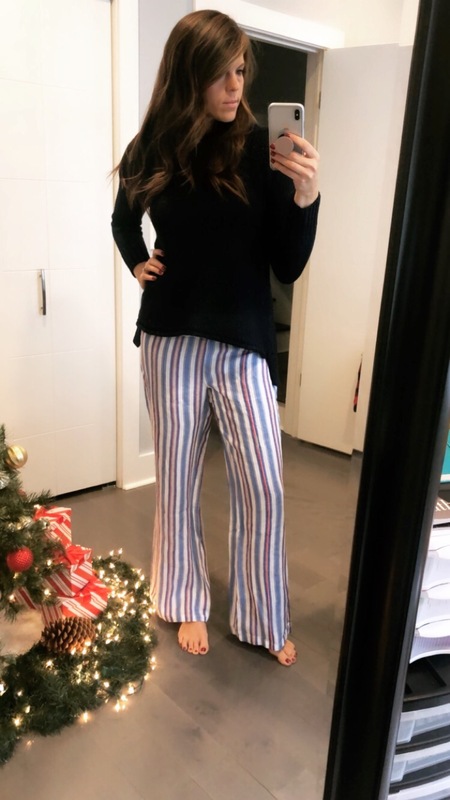 Off the Should Tops scream resort wear to me and their Lila Cold Should Top – Tortola Multi Stripe is right up my alley. It has an elastic top hem which helps keep the top in place. It runs true to size and is only $88. One of my key accessories for resort wear has to be a cardigan. It is the perfect way to dress up an outfit or something easy to throw on when you’re cold. Their Long Flyaway Cardigan- Night Sky is a must buy! No matter what the season or location, this is a key wardrobe piece you should own. It’s super cozy and a truly classic piece. See all their tops here. Whether you’re a shorts or pants kind of gal – HIHO has you covered. They have a variety of styles, prints and all of your classic white attire. As many of you know, I am 5’11 and ALL LEGS! I have a difficult time trying to find pants that are long enough for me. When I came across their Marigot Roll Down Pants, I was in love. The pants are extremely comfortable and very resort chic. You will catch me wearing them beachside with a Painkiller drink in hand! The pants are 100% linen with a jersey knit cotton roll down top. You can match them perfectly with any of their tops or even wear them with a suit. Their Marigot Roll Down Pants is available in White, Coral Fishy, Palm Print and With a Twist. If you aren’t in the mood to wear pants, check out their variety of shorts. My favorite shorts are their Kate Short- Bright White for $69! Classic white shorts is an absolute must for any resort/boating wear. These shorts have a 5″ inseam for a more comfortable fit. The material is stretch poplin and runs true to size. I love the look of these shorts so much. My favorite color is Night Sky. Check out their full collection of bottoms here. They have something for everyone. Now that I have rounded up a few of my favorites take a peek at their entire collection and let me know which ones are your favorites.